Yesterday, as I was pondering ducks, I was reading with my daughter that is ready to enter the first grade this year. Let me preface, SS#1 (my firstborn daughter) has always had phenomenal language skills. She began speaking at a very early age. Her ability to read however, has been a bit disappointing from a teacher's perspective. She is doing fine, but upon entering Kindergarten she had not mastered her letters/sounds. She showed no interest, and not wanting to make it a negative situation I didn't push her. I allowed the teacher to set the pace and then I pushed from her teacher's side. We all know the pull a K teacher has on their students, I used it to my advantage! Anyway, SS#1 is doing fine now, but I was a little apprehensive to say the least. Yesterday we were reading two different books. 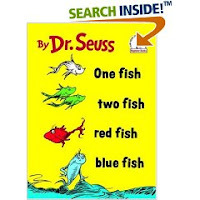 First we read Dr. Seuss' One Fish Two Fish Red Fish Blue Fish, thinking it would be easy with all those phonetic rhyming parts. Wrong!!!! I became very frustrated. Why wasn't she getting all those words. They are the same on each page! I thought she knew CVC rules. Has she lost all of her strategies? 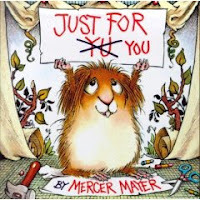 We switched books and decided to read Mercer Mayer's book Just For Yu-You! She did phenomenal! SS#1 reads for meaning! Isn't this what I want! Those language skills, they are what support her reading. She needs to have story for understanding. "What makes sense?" That is what drives her throughout the book. She knows her meager knowledge words, her fluency is great, her decoding does not come from breaking words down. Her approach is genius. She approaches text thinking, "What makes sense in the story for that beginning sound?" Duh!?!?!?!?! While reading the Dr. Seuss book she had no support for meaning, it was all about decoding. I can actually see her skimming the pages looking for picture support and word strategy. She stops at meager knowledge words not because she doesn't know them but she is wondering how do they support the next hard word that is coming up. She is thinking, "how am I going to make that make sense?" Brilliant! 1. How often have I selected a book for a guided reading group because I wanted to teach a new decoding strategy? How often did it have meaning support? 2. Do I teach for strategy or for meaning? 3. Duh, why is this just occurring to me? I have spent all summer reading all things Reading Workshop. I am gearing up for that purpose. I have been struggling with guided reading. How does it all fit? I think reading with my daughter yesterday solved this mystery for me. I still will have guided reading, I still will be teaching phonics strategies, BUT I am more focused on meaning...and then phonics. I know kind of a cheesy title but I think that this post is going to be cheesy too. Today, before entering the local Walmart I noticed two good samaritans trying to corral a mama and her baby ducklings into cardboard boxes. They were so cute, newly hatched they were still yellow feathered and snuggled close to their mama. I was drawn to this action as I thought about the place this mother had decided to nest. This is a Walmart not close to any water, there is not ever really a sufficient place to put a nest even. I'm sure had the babies and mother stayed in this parking lot nest that they surely would have died. However, these kind samaritans decided to save them from their untimely death. We have a family of ducks that travels through our back yard from one pond to another. Every spring she quacks with her babies while crossing our road. Every once in a while she holds up morning traffic while drivers honk and flip her the bird. My oldest daughter always gets annoyed by this, "my goodness, they are just ducks Mama. They are so cute. Why are the cars honking?" My daughter has learned that baby ducks and their mamas are so cute and in need of rescuing. She is only 6. When we lived at the lake we had a duck that took up residence near and around our pier. We named him Bert. He was a little different than all the other ducks because he was a cross between a farm duck and a mallard duck. He couldn't fly it seemed because he stayed during the winter. Bert never had a nest of eggs, never had a mate, never even seemed female. One day Bert showed up with babies. We were never sure where he got them because they were older, not yellow any longer, and he was a wonderful mother. They all lived. He taught them how to be ducks. A day thinking about ducks. 1. I am a good teacher because I allow students to be who they are. I accept them for all their differences and glitches. I not only accept that but I foster that throughout the year. My aide says, "It's like a garden in here, a bunch of varieties all blooming when they are supposed to." I just add water, and sun! 2. If I weren't a teacher I would be a dog groomer, or hairdresser. I like going to both of these places. I also like that there is a finished product. I often don't get to see the finished product and that is sometimes frustrating. 3. My teaching style is very open. I think that I veer off from the beaten path at times and I am safe in thinking that that is what kids need. I enjoy learning right along with my students. 4. My classroom is chatty. I don't mind talking. I often will say, "Do you get this?" to a student. When they do I ask them to peer tutor another student. We are all learning at the same time. My classroom is also diverse. I am the teacher that requests the special needs, special education, etc. in my classroom. I have a concentration in Special Education and this is the reason why: I wanted to know what to do when I had these students in my room and I wanted to be positive about it. I'm so glad I did! 5. My lesson plans, are weekly. I know what skill, what strategy, etc. but the activity changes daily. I have such a workshop setting now that we really have to just go with whatever the kids need. Fortunately it has been successful. 6. One of my teaching goals: I am pushing forward with Reading Workshop (I don't know what else to call it) and hoping for the best. I am excited about all they will be learning. I want my students to feel the same way I feel about books. 7. The toughest part of teaching is knowing so much about their home lives and not being able to do anything about it. I don't think the American public can even remotely know what adult parents are doing to children. I have purchased clothing, lunches, school supplies, snacks for them to eat for supper, field trip money, etc. People have no idea what we do for these kids. I never knew my heart would be pulled on so emotionally. 8. The thing I love most about teaching is not the academia, it is educational, but not a state standard. It is the moment when you must let them go. I love looking at a student that came in different, one that you raised your eyebrows at and thought, "you have to learn to read?" I look at them in June and my heart is so proud of them. I have brought them to this point. We have worked so hard. It is like watching a bird take flight after being caged. It is like a child on a two wheel bicycle for the first time. 9. A common misconception about teaching is that we get money for the things in our classroom. Even down to staples and paper clips a teacher buys it all. For those of you frustrated by the prospect of rising property taxes for education I say, think of your teachers who have not only paid the taxes but are still filling their rooms with stuff that will make their students better. On average, a teacher spends $1200 out of their own pocket for their classroom. Books aren't cheap folks. 10. The most important thing I have learned since starting my career is that my students, their parents, my administrators, and my colleagues just want to be respected as humans. If we validate one another in a loving way we can get so much further than if we are tearing each other down. It has been a lesson in being human. A poem about grief and the emotions experienced during that time. As a poet, it has been observational. As a wife, it has been a moment of anguish for the one I love. Conversations cut short-because of grief. Watery eyes, slow falling tears, a chuckle at a memory. All summer long you get to listen to people say, "You are so lucky to have three months off for summer!" Yeah, yeah, yeah. I have spent already three days getting my room ready for the upcoming school year. I have been in my room early this summer. I just had so much to do. All that reading makes you just itching to get back in there to get started. I got to thinking about all the criticisms that we teachers face because our achievement scores are plastered for all the world to see. It can get a little unnerving even for an optimist like me! I made a list, a list of all the "achievement" that I see because I get to be...A Teacher. -Oh, when they read. First grade, around October, they all fall in love, and you can't get them to put the books down. Not many teachers get to see this transformation but it is just like a butterfly breaking from a cocoon. They read. Spend a day and just focus on that one little skill that you learned when you were in the first grade, it was the foundation you needed for the rest of your life...to read. -How about the struggling student, the one with all the strategies that you have tried and they still aren't with the others. How can you not just ache for them? They inspire you to keep trying, to ask others questions, to read more about them, and finally, you start watching the littlest achievements that they make. It will never be posted in the paper as an achievement- they wouldn't understand, but you saw achievement! -Everyday, from 8:40-3:20 I am among greatness. Future doctors, lawyers, human resource persons, mothers, fathers, ministers, and teachers sit in my room and learn from one another. I have influence in their lives. One person, who gets to touch many. -Forever, I will be learning. Not just the teacher, I am the learner. They share the greatest wisdom these little people. They allow you to look at life through a different set of eyes, I get to witness that, daily. -I came to a realization when I sent my own kindergartner off to school last year. I had such worries, and concerns for her. I wanted to protect her and keep her safe from the world. Looking out at my students I was struck with this realization: Their parents feel this same way. These people must be handled with care. My profession, I feel my impact, I see the responsibility, and I understand the importance of what I do...everyday. Thank God, I am a teacher. My husband lost a friend today. A friend that wasn't very old, quickly lost his life. It has been looming over our home for days now. We have been living, waiting for the news. I got to thinking about what types of children's books deal with death and dying? I immediately thought of all of the books that deal with the death of grandparents. There are a lot of those out there. That is a very real issue for children because a lot of them lose grandparents as children. 1. 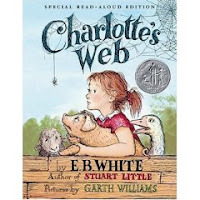 Charlotte's Web- We wept openly this school year when that spider died. I heard the children discussing the importance of friendship, loyalty, and that very special spider. We loved her dearly, not just the character, but the friend she was to Wilbur. She is a very special spider. We talked about her qualities throughout the year, when a friend wasn't being kind, we remembered Charlotte. 2. The Miraculous Journey of Edward Toulane- I happened upon this book because of the Tales of Desperaux, the same author, Kate Dicamillo. This book is about a rabbit, a toy rabbit, that experiences what it is to love, and then loss. In this book one of his owners, named Ruthie, is poor, very sick, and so little. The rabbit grows to love her and be loved for the first time in his existence. Ruthie dies. My students stored Ruthie in their hearts the way Edward did. He talks about how Ruthie's death hardens his heart to never love again. My students understood that opening his heart meant that he might be hurt again. We discussed that after such loss people must choose like Edward to love again. 3. 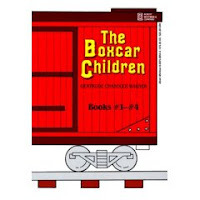 The Boxcar Children- while not a story about dying, the parents are dead, they are orphans. I remember thinking this when I was young and listening to my teacher, why had the parents died? Why would they leave these four children all alone? What was going to happen to them? Why were they so alone? Do you see how these books draw you in? Do you see the emotional attachments they create for children? I do not think that my students will ever forget how we felt about Charlotte. We loved her to the bitter end, we also learned that our reward for loving her was the hope of her 514 children. They lived on, we learned that. We also learned that it was Wilbur's responsibility, as a friend, to continue to care for them, long into the future. A lesson about life. It is our responsibility to continue to care for those left behind. Lessons, on death, and dying. Hipwritermama always has Inspirational Mondays. I love Monday, it is my hen party night, Monday Night Football is coming up, and then I also get to read her posts! Today was especially uplifting for some reason. I guess I got to thinking about several people in my life that are starting over. All of them are going to pursue educations later in life and I am so proud of them. They are living their dreams out loud! What a novel idea! Personally, my dream was to become a teacher and a mother. I guess all this other stuff in my life is a blessing! I'll take it and be content. I am very content. I wrote this poem in response to Hipwritermama's post, hope you all enjoy. I only ask, "where is your dream?" but the need of one. It is the fire I want to be. they are not strong, not ready to sustain the heat. fuel to build the flame. but the flame was relentless, it's spirit unyielding. It's potential, could it be the big flame? Or, will it retreat to the safety of the drawer? But never what it was meant to be. "Aughhh, can you see the little babies? They are so cute!" -All looking inside the birdhouse. My family is big, my grandmother raised 7 children and then her brother's son, so actually 8. I can not remember my grandmother being married. She has always been on her own. She is getting slower physically but her spirit is unyielding. I have the greatest honor of truly knowing her. Today we spruced up her beloved yard. We mulched, and trimmed. We planted, and raked. It was hard, dirty, but fulfilling work. My children played with their distant cousins, and connected with all the world around them. Today felt safe. Today I felt like I was inside the inner circle of life. It was all going on around me. It was an "I remember..." kind of day. I have decided my favorite place in the world is the ocean. Just recently while researching poetry to use in my classroom throughout the year I discovered that I am drawn to poems about the sea. What a wonder the ocean brings! Oh- to live by the sea is my only wish. Here is one my daughters enjoyed just this afternoon. It reminded them of our recent trip! 1. 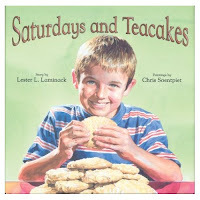 Repetition: I am finding that this is a must in children's books. I can't wait to discuss this with my students. Chrysanthemum, Chrysanthemum, Chrysanthemum! 2. There is an epilogue, students will be introduced to this. 3. The author describes the way Chrysanthemum feels in flower-like characteristics. She wilts, she blooms, she beams, they smell her, they pick her, etc. 4. 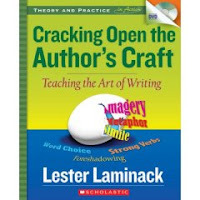 I could use this book when we have discussions about paragraph writing. 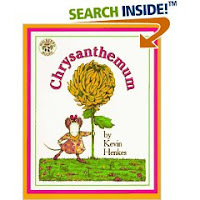 On page 3, the author says, "Chrysanthemum loved her name." On page 4 and 5 the author goes on to support this statement, "She loved the way it sounded when her mother woke her up. She loved the way it sounded when her father called her for dinner. And she loved the way it sounded when she whispered it to herself in the bathroom mirror." Closing sentence, "Chrysanthemum thought her name was absolutely perfect." My most favorite thing of all about this book: It has antagonistic and heroic characters!!!!!! Antagonist: Victoria and her posse Jo and Rita. They tease Chrysanthemum and make fun of her name. They are really disliked by the end of the book. Also, in the epilogue, Victoria goes down in the class musicale, she forgets all her lines as the "dainty Fairy Queen." Chrysanthemum giggles throughout the entire performance. The students love this. It's redemption for Chrysanthemum. Hero: THE TEACHER- Mrs. Delphinium Twinkle! The author builds her up as "an indescribable wonder." The children tease Chrysanthemum and Mrs. Twinkle puts a stop to this immediately! (If you don't know, Kevin Henkes paints teachers out to be just wonderful people, understanding, and heroic). I always share this book with my students during the first day of school, along with Tikki Tikki Tembo, another book on my list. We do some name activities for Math and Literacy. I can't wait to use it throughout the year for Reader's and Writer's Workshop! "Support change: I look at older teachers that buck change and they are so unhappy in the profession. They blame it on the kids, the administration, parents, etc. They don't want to change, are too scared to change, or have no knowledge of what is out there? Those teachers that do support change and have been teaching for years: those people are so contagious to be around. They have so much background knowledge, years of pushing against the regime of mediocrity. They are who I plan to be. Someday I want a 30 something teacher to be looking up at me and be in awe. I want to be contagious, about anything that I deem valuable. If I can live this way, my family, my marriage, my profession will be better. I plan to change: into who I am supposed to be!" I wanted to unravel this for you a little bit. I am not talking about the "unhappy" teachers. We know who they are. They are in every building across America. We know what they do, how they do it, we just don't understand why they continue to do it. They give our profession a bad name. I refuse to give them anymore space than this on my blog! Reading Recovery Teacher: 30 plus years, I have so much respect for her job. She is just outstanding. She serves our school. I serve on a board with her and I love picking her brain about stuff. She is not stuck in the mud but she mulls it over and picks out the good points . She uses common sense, things that have been good quality ideas forever! She is not afraid to ask questions, and she praises you for a job well done. She also asks you to be reflective when things don't go well. Kindergarten teacher: Across the hall I work with an exceptional teacher. Graduates come back just to visit her. She closes her door and magic happens. She is satisfied with being the Kindergarten teacher, not that that would be dissatisfying ever. Those kids are so prepared when they leave her. She has had to change over the years but she has evolved into something spectacular! K-2 specialist- Comes to my room for a half-hour daily and my kids beg to be in her group. She is so good about generating strategies for one student that could help. She gets discouraged when they don't work. She takes it personally when her students aren't achieving what they should. And she is willing to change if it keeps occuring. 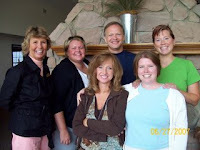 Language Arts Facilitator: Hello, Jen and I led her into the blog world! She personafies change. She left her job, school system, and city to come and work with us crazy girls. I think she loves it, she is always smiling? She always accepts my questions and tries to understand. She then helps me pick out the great stuff and disposes of the rest. She's always willing to change direction if she needs to. These ladies encourage me. I look around and I just remember the greatness around me. I get to work toward that greatness everyday. "This is who I am going to be," I say in my heart. Ultimately, at the end of my career and life I want to pull into my parking spot, hair blowing in the breeze, skin wrinkled by a good, long, life- a little out of breath, but living and loving every minute of it! Hopefully, it will be near my good friend Jen, she will nod to me and I will concur: "We did enough!" 1. Tons of repetition, in fact the text builds upon the repetition. Students will love this! 2. There are italicised words in the book, quotation marks, and commas. This helps with fluency, grammar, and teaching students the fine art of leaving your reader hanging during writing. 3. Time order words help you know that throughout the day Harriet drives her mother wild!!!! Here they are: At, Before, Later. 4. The language of the mother vs. the language of Harriet really shows the age difference. It also shows that Harriet is not that old. 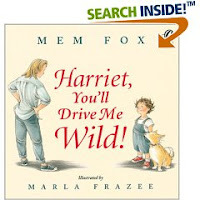 One last tidbit: I made a self connection when reading this book because of my "Harriet." She is four, and yes, she drives me wild!!!! She also loved hearing this book read to her, she can relate. Before my family went to the beach we purchased writer's notebooks for the trip. My daughter that is 4 enjoys drawing pictures in her notebook and writing her pre-literacy words. My daughter that is six is ready for the first grade. She is great mathematically, and is a phenomenal writer. We were getting ready for the trip and she and I had a great conversation about poetry. She asked, "Momma, how do you write poetry?" I then explained that poetry is not like writing a story, or like writing sentences, but more like writing phrases about something. We decided, that while we were on the island we would sit down and write a Haiku about a seashell. (My daughter blew me away with how quickly she picked up the concept of Haiku). Well, we did not write a poem about a seashell we wrote a poem about a shark tooth we found on the beach! I had written a Haiku earlier in the week about these cool little clam-like things that dig themselves in the sand after each sweep of the tide (not sure what their called?). They fascinate me and so I shared this Haiku with her so that she could see the rhythm of the poem. We sat on our porch looking at the tooth, we described its many characteristics (like a scientist) and then we wrote our poem together. It was a very proud moment for me. I also mentioned that I would like to try a tritinia poem while on the island. Cloudscome tried this and I was intrigued by the challenge. My daughter understood what the rules for this poem was when I read it to her... "Cool Mama, you just repeated those words, I get it now!" Ruth had a post recently about thinking of a word to "live by." I have thought long and hard and my word would have to be: OPTIMISM. There is too much negativity in this world, and it just doesn't make sense to dwell. It really does bring people down. If we could all just decide to change the things that we can control. This is not to say that negative things will not come your way, believe me they will. However, if I can't control it, then I shouldn't let it get to me. For instance, I can't control the home lives of my students. It can't be done by me. I can, however, better myself by personally reading about best practices, watching others in action performing best practices, and then doing my best at my profession. This is what I can do, and that seems optimistic, doesn't it!?! Well, that is it for me for a while. I am off to the family vacation at the beach. (YaHooo!) Think of us basking in the sun, reading by the waves, and being positively happy! Anyone, got any ideas for craft within these send me ideas. I'm sure that I could use them. At the All Write! conference I had the privilege of hearing Lester Laminack. Here are a few things that I thought would be beneficial for me. Perhaps you will find them helpful for you as well. 1. Opening Act: Reading just to enjoy a book and build community. Take 10 behavioral problems you have and make a list. Then match 10 books to those behavioral problems and use them for your opening. 2. Use books during transitions. Grab them when you have them and then move into the next subject. Make it a cohesive move, don't make transitions a, "stop this, and then now let's do this." 3. Poetry- Do this during down time, like washing hands, or using restroom. Kids will get done faster because they don't want to miss out on the poem for the day. 4. Use sections of previously read text to help with mini lessons. For writer's workshop, and reader's workshop. 5. Writer's Craft- Pick 10 books to really know as a teacher. Go through them and find the points that you want to teach from them. Pass them off to colleagues, have them find the craft that could be taught from those books. Use them often for teaching craft, and mentor texts. 6. Closing Out the day! (this is my favorite!) He says that we need to leave children hanging when it comes to reading chapter books them. Like a drug dealer, we give them just enough, but not too much. We want them to come back for the product that we are selling. Just like a drug dealer. We are in sales, our product is books. - If we are selling a product:books then we must vastly know literature. We must be able to sell authors, illustrators, and different genres. Titles should roll off our tongue because kids will notice when they don't! - We are like drug dealers, we must leave our students satiated with the books that we are reading to them. It keeps them wanting more. They become addicted! At the All Write! Conference last week I had the privilege of hearing Georgia Heard speak about the influence of poetry in the primary classroom. She stressed the importance of reading a piece of poetry daily, and making sure to introduce all genres of poetry. I was inspired. I was thinking about times in my day when spending 5 minutes to just read a poem would be great. How about that time when we are all standing around using the restroom- you know down time? After that Ms. Heard suggested spending a week dissecting a poem. As she describes it,"climbing inside a poem." (Isn't that just the greatest imagery you can think of?) Here is a layout of that week. I think we will give it a try this coming year. Monday: The heart of the poem. What is it about? Conversations about the poem. Tuesday: Movement in the poem. Act it out, find the verbs. She says that this changes the poem for the children, it is not just a poem anymore, they make it their own. Wednesday: Illustrate the poem. Stretch it into a writing piece. Thursday: About the poet: any information you can have about the poet. Also, what can you compare from this other work? What is the context around the poem? She was very interesting! One of the best points I think that I heard from her that day was her comments about Science and Observation. She mentioned that Scientists and Poets are a lot alike because they are both observational. A poet will look at some form and make all sorts of observational notes, just like a scientist, and then create a poem. Why can't we do this with our children? Have places in our classroom where they can discover? Imagine a T-chart with headings like Scientific Observations Vs. Poetic Observations. Kids could write details about these objects, questions, observations, and descriptive words. Having all genres of poetry around them they would soon get a sense of what poetry is and what it can be for them. I am excited about the upcoming year! Many of you know, I love poetry. Mostly I love writing poetry. I never teach a unit on poetry with my first graders. Just haven't done it, I know shame on me. I have some tools now, after hearing Georgia Heard. I will be sharing poetry with my first graders, not in a unit, but as another genre, daily, 180 days of poetry will be happening in room 127! The warm bodies perspire at the soundof the bell. Then, droplets of it explode from the forcefulness of the blows. Can you see that it's here? flashed red, swollen, and battered.